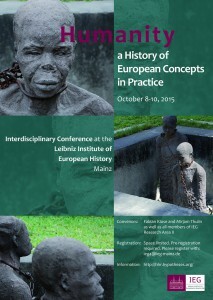 This interdisciplinary conference, organized by Fabian Klose (Mainz) and Mirjam Thulin (Mainz) on behalf of the members of IEG research group “Coping with Difference – Concepts of Humanity and Humanitarian Practices”, was held at the Leibniz Institute of European History (Mainz) from 8 to 10 October 2015. Prioritizing a comparative approach and focusing on the intersection of religious studies, international law and philosophy as well as on the history of humanitarianism and human rights, this conference set out to analyse the varieties and shifting meanings of the term “humanity” within the European context as well as in the context of Europe’s relations to other world regions. Keeping religious, colonial, social and gender aspects of the issue in mind, theologians and historians discussed the topic of “humanity” by focusing on such key issues as morality and human dignity, violence and international law, philanthropy, charity and solidarity. The conference opened with a keynote lecture in which FRANCISCO BETHENCOURT (London) offered a historical review of principal aspects and categories of the division of humankind supposedly based on ethnicity, religion, gender, wealth and social status. He marked economic and political interests as the key motivations behind discriminatory actions and put an emphasis on ideological justifications of those distinctions. Questioning the universality of these divisions, he highlighted power relations as the basis of the categories and divisions, most of which displayed unstable patterns changed or recreated over time. The first panel of the conference, dealing with morality and human dignity in early modern concepts, opened with MIHAI-D. GRIGORE’s (Mainz) presentation. Grigore concentrated on a transition in early modern political anthropology from humanitas Christiana, which viewed humanity as depending on an external or transcendental factor, i.e. God or the Church, to humanitas politica, which understood humanity as being inherent to every human being. Grigore traced this transition in the writings of Erasmus, which emphasises human nature as the property of individuals, not the Church, and a mutual goodwill intensified by education. MARIANO DELGADO (Fribourg) then presented his paper on the reflections of Spanish Catholic thinkers about the “nature” of American Indians in the 16th century. After outlining the dual genealogy of these thinkers’ ideas – the humanistic, enlightened thread stemming from the Stoa, considering the human race as one family, on the one side and Christian theology stressing man in the image of God on the other – Delgado presented two very different Christian thinkers, Bartolomé de Las Casas and Juan Ginés de Sepúlveda, showing how Sepúlveda justified European expansion in the Americas with the Indians’ supposed inferiority, and how Las Casas fought for the recognition of the Indians’ status as human beings. Delgado’s contribution was a reminder both of the variety of Christian thinking in the early modern period and of the strength of humanistic ideas even before the Enlightenment. As commentator, WOLFGANG SCHMALE (Vienna) first discussed how the panel’s keywords like Natural Law, Human Law and Divine Law had shifted and slowly become synonymous. From this point of view, Schmale asked Grigore about the ambiguity of these keywords within their political context, adding that this debate had become anthropocentric. According to Schmale, it should be kept in mind that in that period, political conflict was also a cultural conflict. Referring to Delgado’s paper, he also asked questions about the political dimension of the debate on the humanity of Indians in the early 18th century, which had only become morally resolved after the recognition of Indians as human beings by the Church. The second panel offered some perspectives on modern concepts of morality and human dignity. Referring to the early humanitarian movements, THOMAS WELLER (Mainz) concentrated on the antislavery discourse emerging from the writings of certain Spanish theologians, jurists and missionaries’ on the enslavement of Africans. Although none of the authors had used humanitas as a term to denote universal humankind, their texts had revealed empathy, compassion and a practical sense of humanity. Weller argued that Spanish concerns for the suffering of distant others beginning in the 16th century preceded Anglo-American criticism of Atlantic slave trade. JUDITH BECKER (Mainz), the second speaker, highlighted the German Protestant missions’ understanding of humanity and the aspects of the concept of humanity in their missions as a foundational element in the 19th century. Becker explained on which key concepts the political idea of humanity was established: humanity as humaneness, humanity as unity and equality, and humanity as poor relief. She pointed to belief that all humans were equal and united before God as the strongest motive of the German missions, although the missions also introduced new hierarchies. In his commentary, JOHANNES PAULMANN (Mainz) stressed the human quality of feeling sympathy and also raised the question of gender, which had not yet been discussed in the conference but was an important dimension in 19th-century discussions about humanity. The third panel, under the heading “Social Inequalities”, went far beyond its title and discussed humanity as a religious concept and its practical consequences, which were transnational in character. GERHARD KRUIP (Mainz) examined the idea of an all-encompassing human family as one of the key concepts of Catholic Social Teaching, referring to the final declaration of the Roman Bishops’ Synod ‘De iustitia in mundo’ in 1971 and the most recent encyclical of Pope Francis, ‘Laudato si’. As it was the first encyclical to accept human rights as individual rights, the use of the concept of the whole human family had changed with ‘De iustitia in mundo’. There had been a shift from solidarity to individual rights and he questioned the footprints of this document like the idea of solidarity, common sense and global justice in ‘Laudato si’ in 2015. In her subsequent presentation KATHARINA STORNIG (Mainz) analysed the fundraising texts of three important 19th century associations dedicated to saving children in Africa and Asia. While pointing out the use and various narrative functions of the notion of humanity and related concepts in raising support for distant children, she discussed the transnational character of Catholic organizations. In his commentary notes, GREGOR FEINDT (Bremen/ Mainz) emphasised the conceptual thought on which the family metaphor had been built, the geographical conceptualization of the notion of humanity, the interplay between global and universal claims of humanity and also the terminology and language of the concept of humanity. According to Feindt, both papers revealed that the concept of humanity was more than an empty signifier, but had served different purposes on different occasions. The fourth panel addressed the complex relationship between violence and international law, which was constantly reconfigured by political practices. By concentrating on the abolition of the slave trade as a case study, the first presenter, FABIAN KLOSE (Mainz), analysed the implications of a theoretical debate about the concept of humanity for an interventionist practice in international politics. While pointing to important phases in the abolition campaign against the slave trade, he underlined the transition of the concept of humanity from a moral category to an accepted norm in international law and politics. Klose stressed the crucial role of the campaign against the slave trade for the emergence of the new practice of humanitarian intervention in the course of the long 19th century. Additionally, he put forward an argument worth emphasizing: the appearance of humanity as an international norm did not overcome the existing categorizations in the international system, but rather enabled new divisions, intensifying the ambiguity of the concept of humanity in the context of European colonialism and imperialism. KERSTIN VON LINGEN (Heidelberg) considered the relationship between humanity and warfare, focusing on the concept of crimes against humanity from a perspective of intellectual history. While giving the chronology of endeavours for the humanization of war since mid-19th century, Lingen stressed the importance of the preamble to the 1907 proceedings, the so-called Marten’s Clause, which defined the understanding of humanity and civilized nations and was the blueprint for later attempts to punish war crimes and to protect citizens from crimes against humanity through international law. By presenting humanity as a polemical concept within the International Red Cross and Red Crescent Movement, ESTHER MÖLLER (Mainz) argued that the different usages of concept of humanity had served different functions which could be analysed on the practical, structural and normative level, even if there had been no consensus on its meaning and the area of usage. These three levels interacted with the debates about its political and social scope. So after the second half of 20th century, humanity had become one of the Red Cross and Red Crescent Movement’s litmus tests for the challenges of decolonization and globalization. Möller supported her arguments with examples of different Red Cross and Red Crescent branches. In his commentary notes, MARTIN AUST (Bonn) stressed the use of humanitarianism for the legitimization of interventionist practices by certain countries across the globe, including warfare, and argued that the concept of humanity could not be completely confined to the realm of scholarly debate, depending as it did on many past and present practices. Aust added to the presentations by critically discussing some current examples of the use of humanitarianism for the legitimization of interventionist policies, thereby showing that the story of violence and international law continues to unfold. The Fifth Panel of the conference was devoted to the concept of philanthropy, which is central element to discussions of humanity and humanitarianism. Providing an overview of the concept of tzedakah (“righteousness” / ”charity”) and its practice in European Jewry as a measure of civilized behaviour up until the end of 18th century, MIRJAM THULIN (Mainz) emphasized the importance of solidarity in Jewish society and transformation process of the understanding of solidarity via philanthropic organizations in the European context in the course of 19th century. Subsequently, PETER JAMES YODER (Rome, Georgia) provided an insight into the belief in rebirth and its centrality to the idea of supernatural transformation of human nature in Pietist idealism. Exploring the handwritten sermons and printed texts of pastor-theologian Friedrich Adolph Lampe in order to understand the reformed concept of humanity, Yoder analysed reformed Pietist notions of humanity in the early 18th century and their role in early Protestant social movements, which granted higher levels of gender and social equality to individuals. The last presenter of the conference, JOACHIM BERGER (Mainz), discussed the relationship between masonic internationalism and humanity, examining European freemasons and their cross-border communication and organization from the 1870s on. He focused on how the interests of national masonic organizations conflicted with their international aspirations. Berger also mentioned the increasing instrumentalization of ‘humanité’, which had been expected to overcome conflicts between masonic groups and the disunity of their cross-border initiatives. Berger explained how the use of humanity as an element of masonic internationalism made this concept a parameter for negotiating religious, ideological, social and national differences. Summarizing all three presentations of this session, MANFRED SING (Mainz) pointed to their shared emphasis on the concept of humanity, mainly from the viewpoint of practices and their connection to ideas. With regard to all three papers, which concluded that thought and ideology led to or determined practice, Sing asked whether they might not be so closely related as it might appear at first sight. In order to understand humanitarian practices, the broader background of social and political circumstances needed be investigated. In his keynote lecture “Universalism and its Discontents: Humanity as a 20th-Century Concept”, PAUL BETTS (Oxford) reflected on how the concept of humanity was used, abused and politicized at distinctive moments during the 20th century. Putting particular emphasis on World War I, 1945 and decolonization, he explained how the concept of humanity has evolved and transformed. Unlike the moral and theological understanding of the concept of humanity in the 19th century, the discourse of humanity was adapted to political and international interests during the first half of 20th century, particularly with the effect of two world wars. A new sense of humanity comprised social, economic, political, cultural and ideological concerns after the war period and ‘civilization’ became one of the key terms in the rise of the discourse of human rights. In the second half of the 20th century, humanitarianism gave way to internationalism under the influence of decolonization. 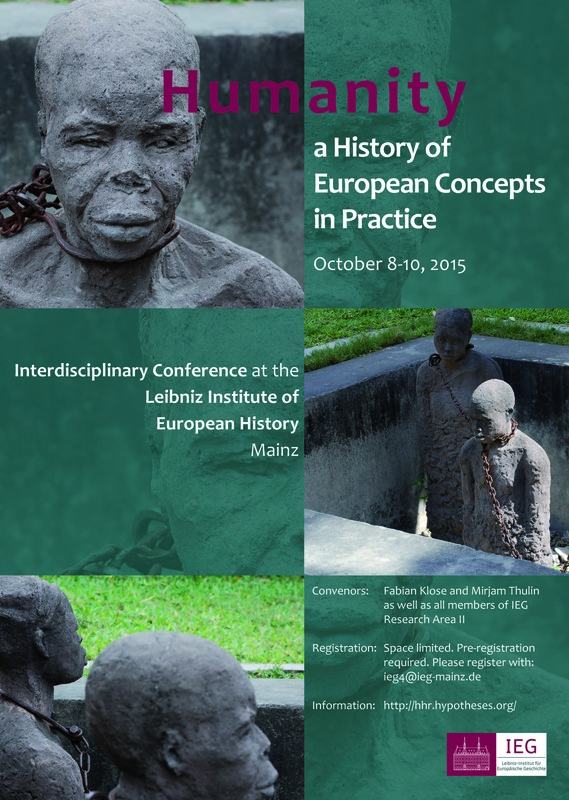 The conference concluded with remarks by JOHANNES PAULMANN (Mainz). He summed up the six main subjects of discussion during the conference as follows: Firstly, he concentrated on the concept of humanity, describing it as dependent on some sort of ‘other’ raised upon oppositions, drawing lines and delimitations; a change from a theocentric notion to an anthropocentric one based upon cultural plurality. Secondly, he concentrated on different meanings and objects of humanity as an actor, an aim, a quality or a space in which certain principles were applied. Different modes of this concept might have different implications for practices. By treating humanity as a dynamic process, Paulmann subsequently underlined different means for starting this process. He mentioned some historical and modern instruments of this process, like missionaries, churches, humanist movements and UNESCO. Paulmann then discussed humanity as a procedural concept, which leads and led to different hierarchies and categories. He also stressed the importance of the usage of humanity as a concept both in theory and practice. It had been so difficult to protest the abuse of the concept, especially because the context in which humanity was used was sometimes historically blurred. Paulmann finished by asking what was European about this concept and looked ahead to the difficult task of mirroring the voices of those who were addressed by it. Underlining theoretical debates about the concept of humanity in its historical context and discussing the consequences of various practices of humanity over time, this interdisciplinary conference was able to provide a rich contribution to the emergence of new discussions on the concept of humanity by providing different perspectives on current debates. This entry was posted in Actualités / News, Conferences and tagged Human Rights, Humanitarianism, Humanity, International Law, Religion by Fabian Klose. Bookmark the permalink.